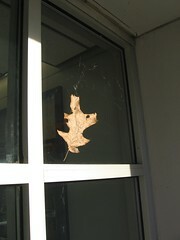 Saw this poor leaf tangled up in a spider’s web this morning as I walked into my building. Although ending up here rather than in the business end of rake might be a higher calling for a leaf? ?